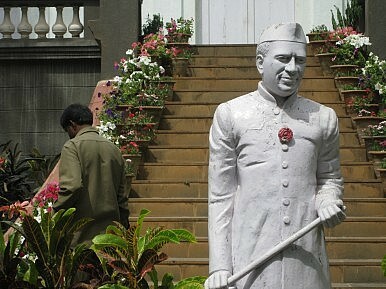 India’s first prime minister, Jawaharlal Nehru, changed India in important ways. His legacy persists. Over the last two weeks, it’s been difficult to avoid the media overload of the various dissections and analyses of Indian Prime Minister Narendra Modi’s first year leading India. While India reflects on at Modi’s first year, it’s perhaps an opportune moment to reflect also on the first individual to hold that position: Pandit Jawaharlal Nehru, whose 51st death anniversary passed on the first day of Modi’s second year in office. Let me preface this by saying, like most, I have been critical of Nehru, especially on the economic front given his socialistic tendencies. A staunch socialist arising from the Fabian school of socialism, Nehru pushed a centrally planned economy in the hands of the central government in New Delhi. This misplaced sense of economic idealism set the doctrine for the Congress Party and its economic policy over its many decades in power. With a growing population, this form of dirigisme wasn’t exactly self-sustaining. In fact, it was counter-productive; it stifled entrepreneurship while empowering a mediocre bureaucracy. Some economists would rightly point out that the liberalization of the economy in 1991 was more of an attempt to resuscitate a nation in financial peril than a sign of Indian embracing modern economic practices. Nehru also wrongly prioritized universal suffrage before universal education, making India the largest illiterate democracy when it first went to the polls in 1951-52. The right to vote is indeed empowering but in the hands of the largely uneducated polity of a nascent democracy, it perhaps contributed to decades of Congress sycophancy in India’s ‘Cow belt,’ a region that became a stronghold for the party. On the foreign policy front, historians will rightly point out that for someone with a great panache for dealing with foreign leaders, Nehru’s biggest shortcomings came on geopolitical issues. Hard to imagine that the Prime Minister would tolerate such a churlish tone, let alone see levity in it. But he did, and to go one step further, Tyagi and Nehru shared a convivial relationship. This perhaps is the legacy of Nehru’s character. Another story that adds affirmation to Nehru’s genteel character is one involving the late cartoonist R.K. Laxman. Story has it that Nehru was caricatured by the legendary R.K. Laxman after the Sino-Indian war in 1962. Today, cartoonists globally could be subjected to threats and come under attack for innocuously spoofing elected officials and celebrities. But back then R.K. Laxman was pleasantly surprised by a phone call from Nehru himself. The prime minister told Laxman: “Mr. Laxman, I so enjoyed your cartoon this morning. Can I have a signed enlarged copy to frame?” And sure enough, there hung a print of that cartoon in Nehru’s office. On gaining independence in 1947, rumor has it that Mountbatten and the colonialists assured him that he wouldn’t have to worry about uniting a heterogeneous nation like India under a single Republic. Given the fissiparous nature of the princely states, he was assured that the nation would soon disintegrate geographically. While credit has to be given to Sardar Patel in uniting India’s princely states, few at the time philosophically fathomed the challenges of binding a nation like India: how does a nation of over a billion people—or 17.5 percent of the world’s population,—home to every religion known to mankind, 4,600 castes and sub-castes, 22 major languages, 13 different scripts, and hundreds of dialects, continue to remain united? I don’t think there is a single explanation as to what keeps India united, but much of what modern India’s unity is indebted Nehru. Most importantly, many colonized countries that attained freedom at the same time—none as vast and as complex as India—promptly became tin pot dictatorships. Nehru laid the foundations of a vibrant democracy that India continues to celebrate today—the same democracy that made the election of Narendra Modi possible in 2014. While every general election in India can be regarded as the largest voting exercise in democracy, the 1951-52 elections saw universal suffrage at time when there were still nations in the “developed” west that hadn’t established voting rights for their women–Switzerland enacted universal suffrage at the national level in 1971. In practical terms, Nehru’s legacy extends to other feature’s of India’s modern identity. English’s status as a national lingua-franca across the academic and the professional spheres in India is thanks to Nehru’s vision. Additionally, India’s world-class higher-educational institutes and the foundations of New Delhi’s space program were put in place thanks to his visionary foresight. It was once rightly said, if Nehru had been a different man, India would have been a different country. But John Kenneth Galbraith, an economic guru and former U.S. ambassador to India summed it better by saying “with India, Gandhi was its history; Nehru, after Independence, its reality.” Nehru’s immortal legacy thus is India’s continued existence as a thriving and growing democracy. Whatever his shortcomings may have been on foreign and economic affairs, India as it exists today could not have come about without Nehru. Akshobh Giridharadas is a Singapore-based journalist. He tweets at @Akshobh. What is the meaning of Rahul Gandhi's last minute move?